Rates: $99 USD per person. 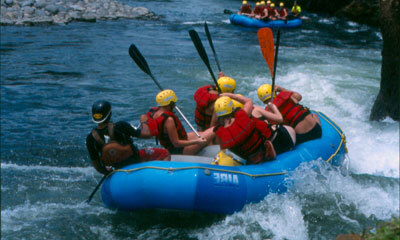 Experience the full explosion of excitement which is the thrill of white water rafting!. The scenery while rafting is just marvelous. The vegetation that will surround you plus the power of the waters will transport you into a great wild adventure. The equipment will be given, and a specialized guide will instruct you on how to manage yourself into the strong currents of the river. This tour will take you through one of the most beautiful and impressive rivers of America. Class II, III and IV. Ideal for experts and beginners. The Pacuare River is one of the best choices for your adventure treks in Costa Rica. Pacuare is world famous for its sheer beauty. A true river gorge, it is flanked by steep, green walls. You see waterfalls cascade into the river from both sides as colorful, tropical birds fly right over your head. Amazing views of this virgin tropical rainforest area. The white water that is equally exciting. It is not an overly challenging river, but it has a lot rapids, therefore giving you an adventure filled with lots of fun. The 18 mile one day run includes a total of 52 rapids. Few rivers in the world can offer you so many. Upon arrival to the river we will gear you up with a life jacket, helmet and paddle and then brief you with a full safety orientation talk. Finally, it is time to take off down the rapids! The first 4 miles consist of fun class II-III rapids which is a perfect time to test your new river skills and gain confidence in your team. Here you can find pockets of secondary growth forest that is extremely beautiful. After about 40 minutes we will enter the famous Pacuare River Gorge, which is 5 miles of some of the best white water Costa Rica has to offer. The rapids here are “Terciopelo snake”, “Double drop”, “Upper and Lower Huacas”, “Pin ball” to name a few. You will also see the Huacas watefall, a 150 foot dramatic drop into the river. After the gorge the rivers opens up to a 5 mile stretch on the Valle del Pacuare, where the river has a different character. It is wide open, which gives you the opportunity to rest a bit and take the opportunity to do some wildlife spotting. The main rapids here are “Cimarrones”, “The Play Hole”, “El Indio” and “Magnetic Rock”. The forest remains just as lush, and the rapids just as fun. We finish in Siquirres, at our own private Exploration Center, where you can take a shower, change and enjoy the gardens and terrace while having a beer or two and reflecting with your new friends about the great adventure you just shared. Then, transportation to your hotel is provided. Departure point: Tour departs from all major hotels in Cahuita and Puerto Viejo. Return details: Returns to original departure point at approximately 5:00pm.